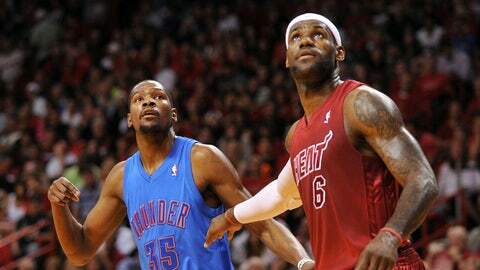 Oklahoma City's Kevin Durant and Miami's LeBron James provided one of the more memorable Christmas Day battles in Heat history. The Miami Heat will be in Los Angeles on Christmas Day, when they’ll play the Lakers as part of the NBA’s holiday serving of games. It will be the 10th time the Heat have played on Christmas beginning with a 90-80 loss to Michael Jordan’s ’97 Bulls in Chicago. They enter this year’s game with a 7-2 Dec. 25 record, having won their last seven. It was a rematch of the ’12 NBA Finals. And once again, the Heat prevailed at AmericanAirlines Arena. Thunder stars Kevin Durant (33 points) and Kevin Westbrook (21 points) each missed a potential score-tying 3-pointer in the final seconds. Both teams played hard in an intensely played game that included five technical fouls. A hard foul led to double technicals on Wade and Serge Ibaka early in the fourth, and even workout partners Durant and James were yelling at each other in the final minutes. "I’m tired as hell right now," James said more than an hour after the game. The win improved Wade’s Christmas Day record to 7-1, and James won his sixth straight on the holiday. 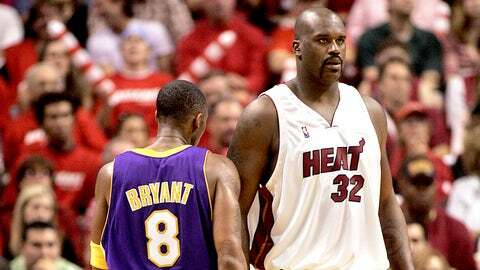 Kobe Bryant and Shaquille O’Neal refused to shake hands in 2005 as they did prior to their 2004 Christmas Day matchup. In the second straight Christmas matchup including Shaquille O’Neal vs. Kobe Bryant, it was former Lakers guard Gary Payton who stole the show at AmericanAirlines Arena. Payton left the bench to score 21 points, including the go-ahead 3-pointer off O’Neal’s assist with 1:05 left. It was Miami’s second straight Christmas triumph over Los Angeles. Payton, who played for the Lakers in 2003-04 — the last year O’Neal and Bryant were teammates — refused to get involved in any feud between between the two superstars. As with Los Angeles, Payton signed a one-year deal with Miami to continue his pursuit of an NBA title. "We didn’t bring him here on a gurney," Heat coach Pat Riley said. "This is not a quick trip to South Beach. He still has the ability to make some big plays, and at the same time he did a great job defending Kobe." Bryant scored 37 points on 12-of-30 shooting, but 0 of 8 from 3-point range. As for the O’Neal-Bryant relationship, the former teammates refused to acknowledge or look at each other before the game, not shaking hands as they did the previous year before the Christmas tip-off in Los Angeles. "It was just another game to me," O’Neal said. "It’ll come back around in about 15 more, because we go back out there in January and it’ll be the same old stuff again." LeBron James had a triple-double in his first Christmas Day game with Miami. The King had 27 points, 11 rebounds, 10 assists and hit five 3-pointers at the Staples Center. In compiling his third triple-double with the Heat and 31st of his career, James also outplayed Kobe Bryant, who finished with 17 points. It was James’ second straight Christmas win in the Lakers’ home arena, following Cleveland’s victory the previous year. "We’re not trying to make a statement to anyone," James said. "We’re trying to show each other that we can play at a high level and try to get better every game. This is one game. â¦ We’re happy because we got better today." Chris Bosh had 24 points and 13 rebounds, Dwyane Wade added 18 points on a sore knee and the Heat won for the 14th time in 15 games. Because this was the season opener following an NBA lockout, the Mavericks raised their NBA Championship banner before the game at American Airlines Center. Dallas beat Miami in the NBA Finals six months earlier. But Miami reigned on the Mavs’ day. James (37 points, 10 rebounds and six assists) and Wade (26 points, eight rebounds and six assist) helped the Heat open a 35-point lead midway through the third quarter. "Celebration or not, we had a game plan and implemented it," Wade said. "We came out and played a good game." Miami went on a 12-0 run late in the first quarter, a 15-1 spurt in the second quarter, then a 14-0 run in the third period. "It was showtime," Heat point guard Mario Chalmers said. "That comes from playing a whole season together last year and working out during the offseason with each other." Hyped as the first meeting between between Shaquille O’Neal and Kobe Bryant since becoming ex-teammates, the Heat and Lakers produced a memorable game at Staples Center. O’Neal (24 points, 11 rebounds) fouled out late in the fourth quarter, so it was up to Dwyane Wade and Eddie Jones to lead Miami in overtime and help the Heat extend their winning streak to 11 games, equaling a then-franchise record. Wade had 29 points and 10 assists. Jones, another former Laker, had 18 points and seven rebounds. Udonis Haslem had 11 points and 11 rebounds. Kobe Bryant scored 42 points, but none in overtime, missing three shots including a 3-pointer at the buzzer. "I knew that it wasn’t going to go in," O’Neal said. "It’s called Shaq O’Neal fate." O’Neal tied the game by dunking off a missed shot with three minutes left, but picked up his sixth foul 45 seconds later when Bryant drove toward the basket. O’Neal and Bryant acknowledged each other briefly before the opening tipoff. "I think it was great before the game that the fans paid their respects for all that he’s done for the organization," said Bryant, Shaq’s teammate for eight seasons during which the Lakers won three championships.